I LOVE LATKES! They are my favorite part of the holiday season. My good friends Scott and Robert hosted a fabulous Hanukkah dinner party, and Scott came over so we could make latkes for the evening. We had a great time, and my apartment still smells scrumptious. We winged the recipe because both of our families traditionally use the Manischewitz latke mix, which is wonderful and homey in its own right. But we like to cook, so we made them from scratch. I definitely recommend making your own latkes- but don’t do it for a big crowd your first time around. Making a single batch for your family requires much less time and will allow you to perfect your technique. 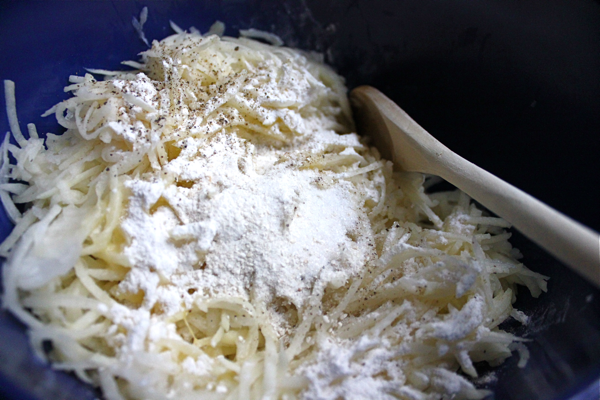 To prepare the latke mixture, first grate 4 baking potatoes. 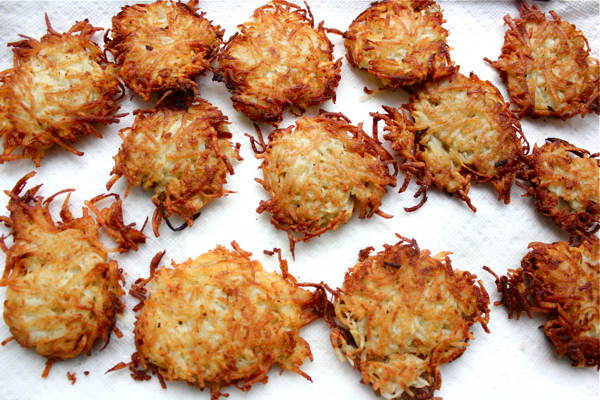 4 potatoes yield about 28 latkes. We peeled the potatoes first, but it’s not necessary. I also highly recommend using a food processor to grate them because you are sure to lose a knuckle if you use a box grater. 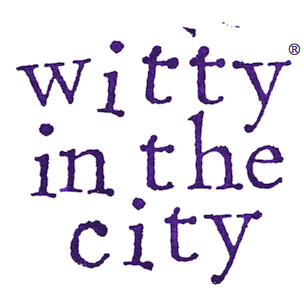 Another alternative is using pre-grated potatoes from the supermarket (a tip shared by another fab party-goer). Also grate 1 onion. Squeeze as much liquid as you can from the potatoes and onion. I do this by putting the gratings in a colander or mesh strainer and pushing down on them. You can also use cheese cloth or gauze to wring the gratings out. Whisk two eggs in a side bowl and add them to the potato and onion, along with 1 tablespoon of flour, 1 teaspoon of salt, and 1 teaspoon of black pepper. We also added 1/4 teaspoon of baking powder and a sprinkling of matzoh meal, but I’ve made latkes without these ingredients before and they turned out just as delicious. When it comes to fried potatoes, you really can’t go wrong. They are likely to turn out delicious no matter what you add, so don’t worry! Mix everything together very well. Cover a skillet with vegetable oil, and heat it over medium-low heat until a piece of shredded potato dropped into the oil sizzles. Then, use a 1/4 cup measure to scoop the mixture into the pan. 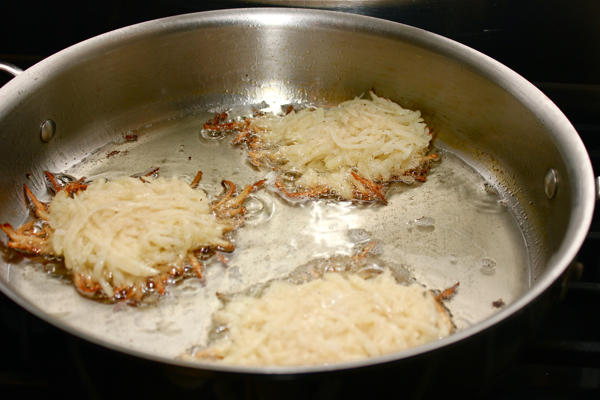 Press down on the latkes with a spatula to form patties. You might want to cook one test latke first to check your seasonings before you fry all of them. When the edges of the latke start to brown and the bottom is golden, flip it to cook on the other side. They should take about 3 minutes per side. 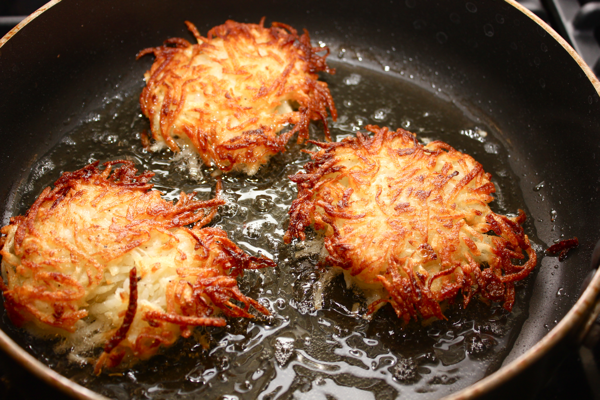 Remove the latkes to a plate lined with paper towels to drain. They are best eaten immediately with applesauce (preferably Robert’s homemade version), or you can crisp them up in the oven if you decide to eat them later. 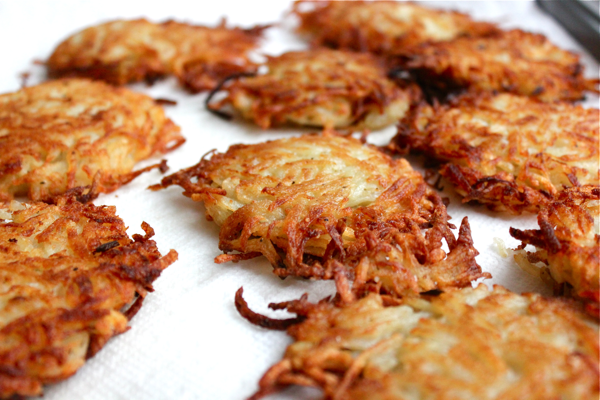 These latkes are so delicious, and they should not be confined to the Hanukkah season. Spread tasty joy all year long! They do look amazing. Save some for David and Stella. It is the Polish way to eat these topped with sour cream. Even better than apple sauce.